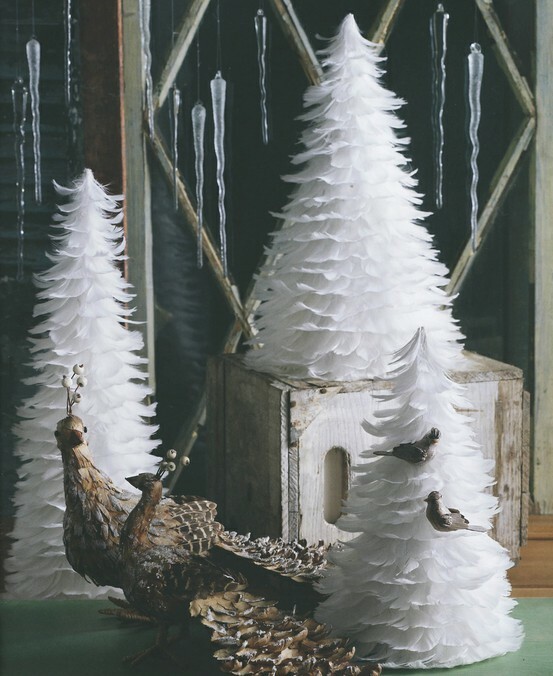 Guys, I found some great ideas for miniature Christmas trees that you can make yourself using ordinary supplies that you probably already have laying around the house. The only thing you need is a little bit of free time and patience. They will make for some great Holiday decorations and will cheer you up for sure! You’ll need: a wide short glass (it would be cool to fill it with orange peel), white cupcake liners, silver glitter, a small decoration for the top. A colorful, glittery version (right side)! So cute!!! 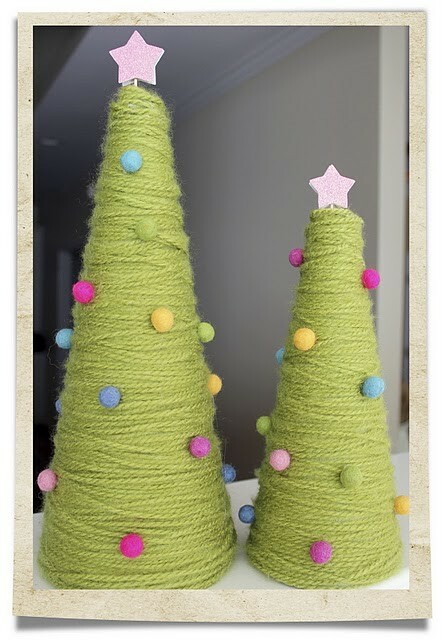 You’ll need: a cardboard cone, thick green yarn, little yarn colorful globes, cardboard star for the top. 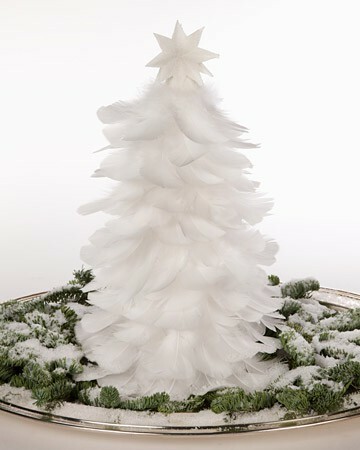 You’ll need: a cardboard cone, white feathers (you can make it any color you wish if you have colorful feathers), glue. 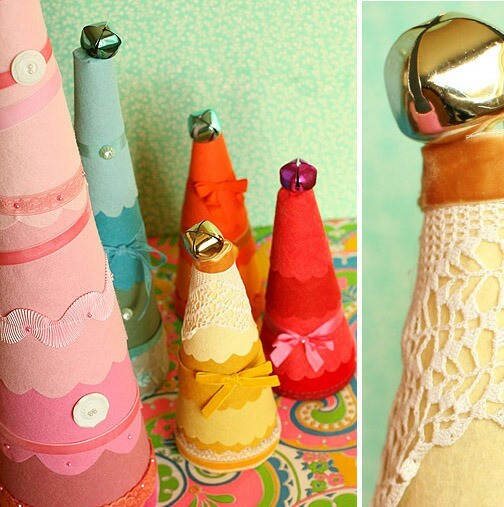 You’ll need: a cardboard cone, colorful fabric and paper, ribbon, buttons, a small decoration for the top, scraps of lace, velvet and glue. 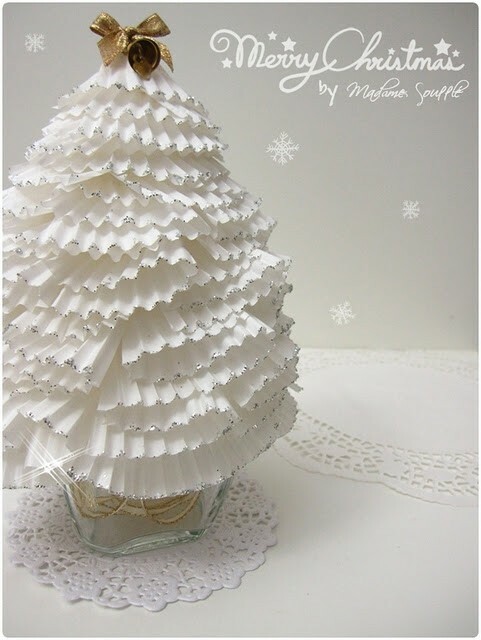 You’ll need: a cardboard cone, red fabric, scissors, white beads or gold beads, thread, glue, big gold star for the top. 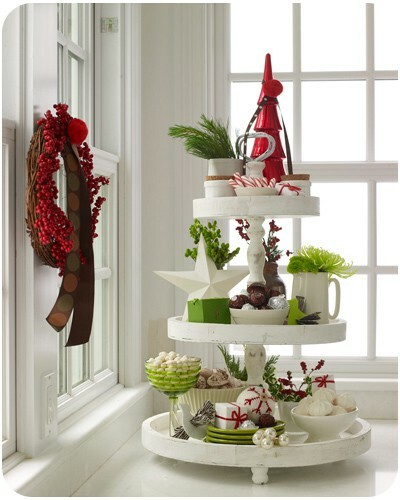 You’ll need: a three (or more) tier serving rack OR a three tier cupcake stand, different cute objects you have around in white, red and green to decorate the rack, you can always fill the rack with colorful food. 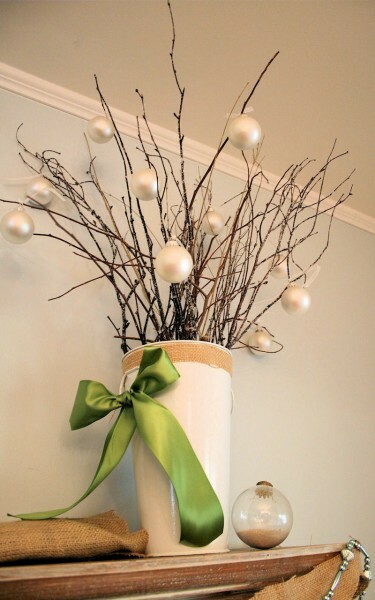 You’ll need: a tall white vase, tree branches, Christmas globes (they look really elegant in white), a big green, fabric bow, thin rope to decorate the upper part of the vase. You’ll need: pretty little cupcakes and candies that you arrange in a pyramid shape, orange slices. Like the first... so elegant! And the last one because i am a sweet addict! Ohmigosh, some of these are TOO cute! great selection! I can't choose my fav! I'm sure that my daughters love this post. I love this post, so many great Christmas inspirations for me and my home, especially tall serving rack Christmas three - it is gorgeous :) kisses! Such lovely creative ideas! I am going to try out a few! 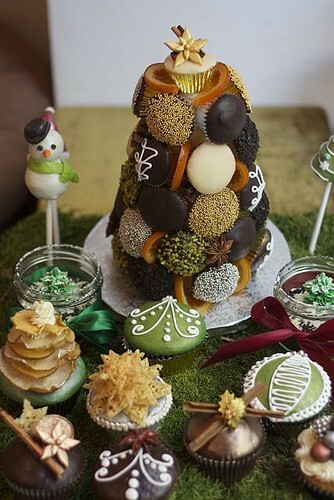 Loving the cupcake liner, buttons and minimalist trees! I've seen some reaaaally awesome minimalist trees, so creative! This is inspiring! I'm going to do some DIY this weekend!! they are soooo cute!! would definitely do this! very nice.. poti sa imi spui te rog ce s-a intamplat cu faboulista... nu a mai postat nimic din august nici p blog nici p fb ..te rog ..
PD: could you follow me back? I tried it again with Google Friend Connect - hop it works! I love the first idea and the paper idea too ! It's rally amazing ! Really love your blog:) Following!!! amazing Christmas trees :) love it! Primul si al 3lea mi se par geniali :)) :X. These are such cute inspirations! I love the pink cupcake liner one and the feature one. 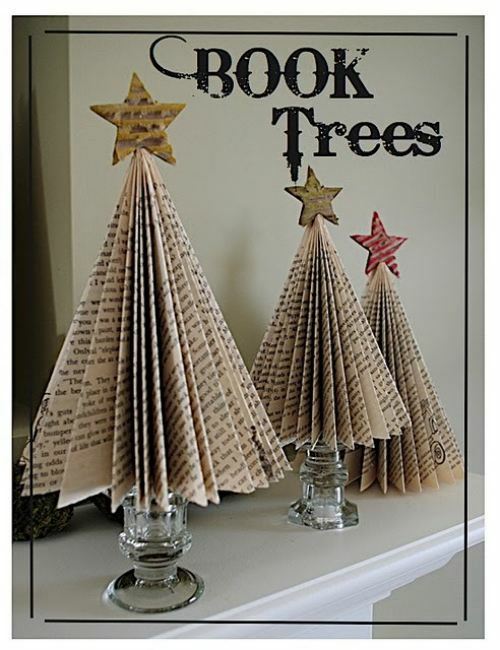 What great ideas, especially if a regular tree is too big! WOW. These are all so amazing! These are all fab ideas!I'm tempted to do a couple of them and decorate each room of the house! check out my blog! i'd love it! greats ideas! 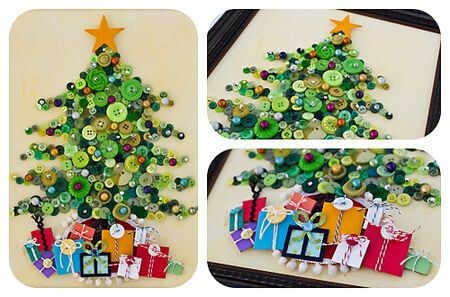 my favorite is The buttons Christmas tree. Love this post!! 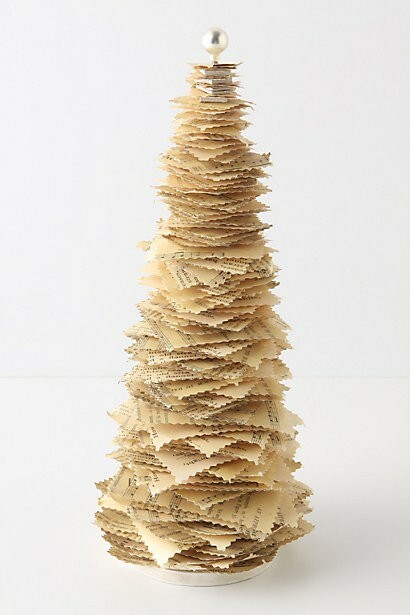 So many creative ideas for a 'different' christmas tree! So cool! 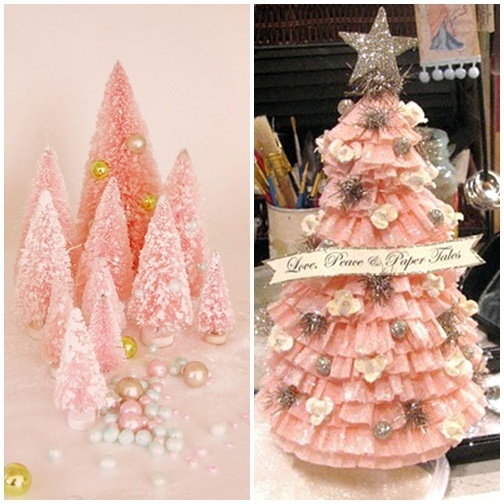 I wouldn't mind a candy tree and those paper trees are so cool. These are such fun alternatives to traditional trees and they don't take up as much space in small apartments! Such a wonderful blog, I love it. I'll be following you. Beautiful trees. Sooo cute! Great ideas. Keep on doing such a good work on your blog! they're just treggings from TOPSHOP~ it's like a plum, my fav this AW! 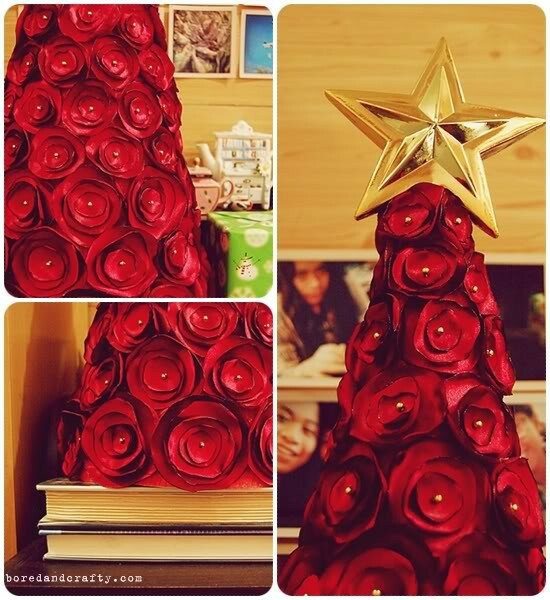 I love all these christmas tree ideas! I will attempt to make one next year as it's too much of a rush now hehe. Love your blog too, followed!